This is a 1-day event for students, developers, entrepreneurs, modellers and of course… data scientists who would like to join the Data Science Hackathon of the Delft Software Days – Edition 2018 remotely. The participants will be given 2 complex challenges they can choose from, real datasets, and 2,5h time to complete assignments. The tasks will focus on hydrodynamics and water quality. The completion of the assignments will need a mix of knowledge such as physical processes, programming, policy, and skills such as the ability to provide data-driven solutions. You will be grouped in teams based on your skills. It is a competition, therefore there will be a winning team! The day will start with a Google Earth Engine tutorial, where you will learn how to process petabytes of Earth Observation data. All you need for that is a Gmail account. 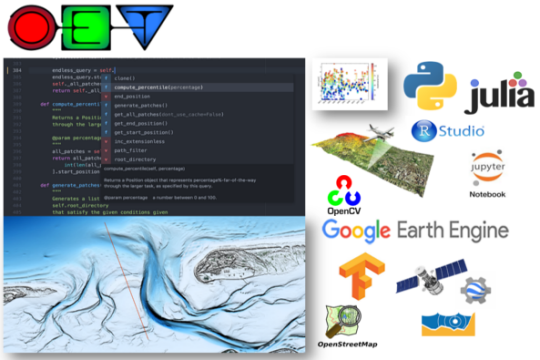 Sign up to https://signup.earthengine.google.com/#!/. We would like to invite you to participate in this special webinar. Senior Consultant at Deltares, Ph.D.
Reserve your webinar seat here. After registering, you will receive confirmation via e-mail containing information about joining the webinar. If you are not able to participate but would like to receive information, please mail us at academy@deltares.nl. Finally, do not hesitate to forward this invitation to other people who might be interested in participating. We look forward to seeing you at the Data Science Hackathon – online!